Agility CMS | Agility Opens Up: Decoupled and Headless? Oh Yes! Unlock your Agility Content Architecture like never before. Up to now, Agility has been the best option for .Net developers as a "Decoupled" CMS. Our approach has always been "Content First." You can create and implement amazing Content Architectures upon which you can continue to grow your websites and other digital properties for years - and that's what many of our customers already do. Our sync API is unparalleled, and our .Net SDK has been around for more than a decade. With our support for ASP.Net Core we are continuing to lead the pack - we’re confident in saying that it’s rock solid for .Net developers. But what about everyone else? How can we help them to take advantage of Agility's benefits? By making it available to everyone, of course - not just .Net developers. How does that change how Agility works today? Currently, the Agility system is already a "decoupled" model that follows a content sync pattern, with an SDK for .Net. Moving forward, we will be including Headless support, with REST APIs and SDKs to allow for modern development practices using whatever language, framework, and methodology you prefer. This sparks a whole new set of capabilities for development using Agility content! What's even better is that it won't be a breaking change: existing customers will be able to continue to use the Decoupled Content Sync model in conjunction with the Headless model. Right off the bat, you can take advantage of tools such as Gatsby and Netlify for websites that are lightning fast, serverless, and super-reliable. 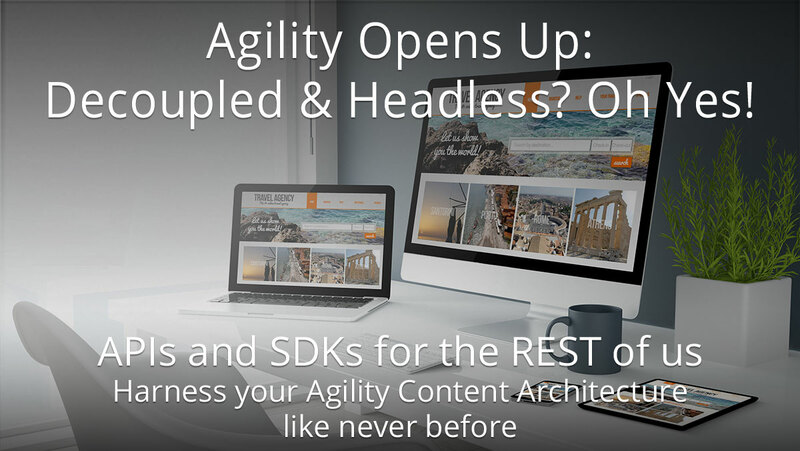 Make your Content part of your modern website development with Agility's new Headless offering, coming very soon.